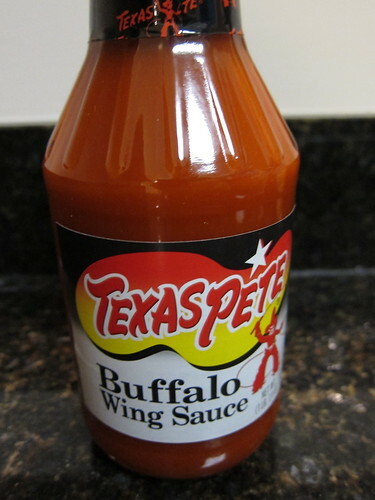 This bottle of buffalo sauce has been staring at me from the cabinet. Each time I reached in to get oil or balsamic vinegar, I would see the bottle and think “What will I do with that bottle?” I thought I wanted to make buffalo chicken dip, but then decided buffalo chicken shells was what I wanted. I didn’t use a recipe for this, but just made it up as I went along. 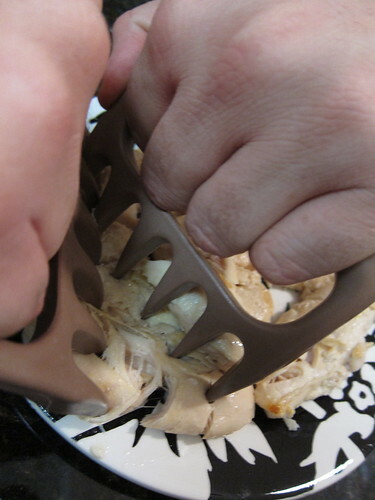 I started by cooking the chicken and then used my bear claws to shred the chicken (which was so much fun I had a willing helper). 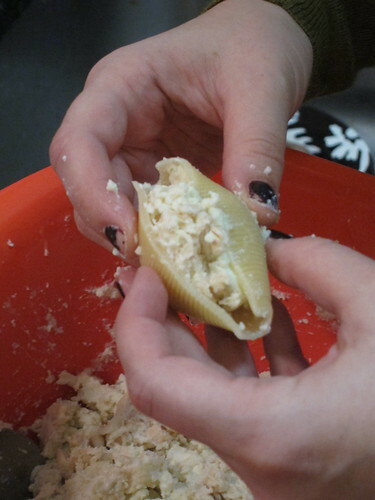 Then I made the filling, which was the chicken, ricotta cheese, blue cheese, mozzerella cheese, and the egg. Meanwhile, I was cooking the shells. 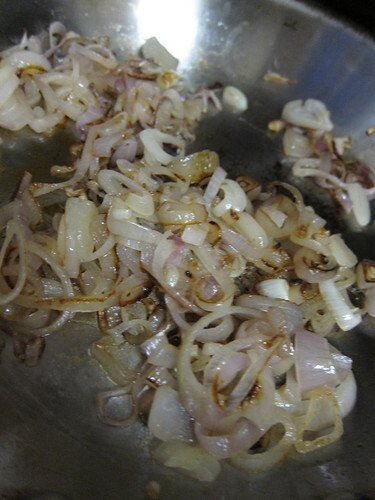 I sliced the shallots and sauteed them with butter. 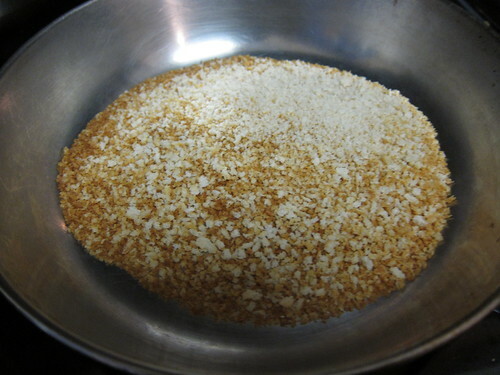 I toasted the panko until the crumbs started to brown and then removed the panko to a plate with cut up butter. 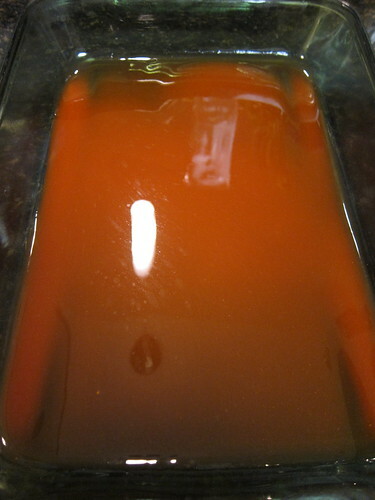 Once the shells were cooked and cooled a little bit, I prepared my pan by pouring in a layer of buffalo sauce. 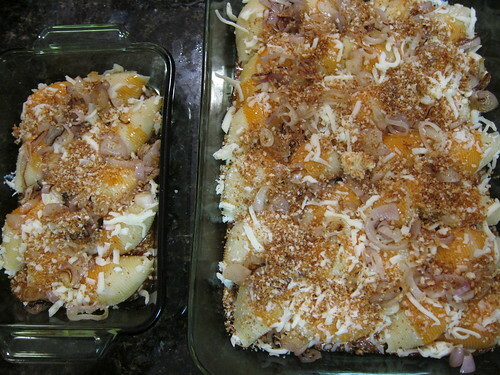 Once the shells were stuffed and the tray was filled. I poured more buffalo sauce on top, sprinkled on mozzarella cheese, spread on the shallots, and finally the panko breadcrumbs. 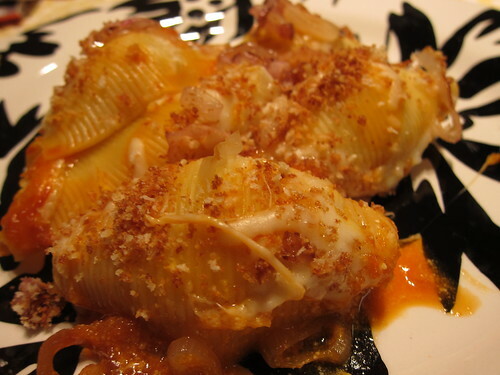 Like most of my cooking, I made enough for about 8 people (it was just me and the bf eating these shells). I baked these trays for about 25 minutes at 400 degrees (I think). This was definately a many pot meal, but while the shells were in the oven I was able to do the dishes, so I didn’t feel overwhelmed with clean up like I do sometimes with many port meals. I really liked the shells; they were spicy and it was a nice twist to the typical shells or the typical buffalo chicken. Given them a try! 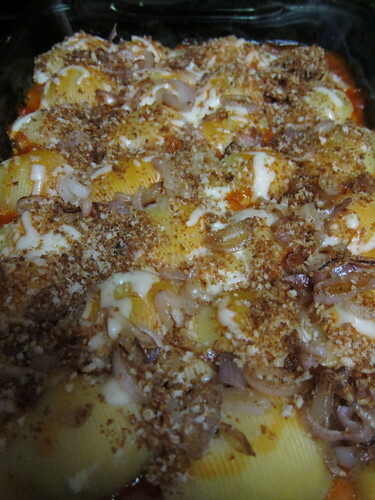 This entry was posted in Cooking and tagged buffalo sauce, chicken, Many Pot Meal, pasta, shallots. Bookmark the permalink. Um. These look absolutely absurd in the best way possible. I’m now very intrigued with other things that you could stuff into shells. The same way @DCEmpanadas stuffs ridiculous (awesome) things into their empanadas…but in shells. Kind of like the meat pies. I feel like there are other possibilities out there just waiting to be stuffed into a shell or dough of some sort.